Kyrgyz Presidential candidate Sooronbai Jeenbekov casts his ballot at a polling station in Bishkek, Kyrgyzstan, Sunday, Oct. 15, 2017. Incumbent Almazbek Atambayev’s chosen successor came out on top in Sunday’s election. Sooronbai Jeenbekov, of the Social Democratic Party (SDPK), looks to have triumphed in momentous Kyrgyzstan presidential election. Preliminary counts show him capturing just over 54 percent with main challenger, Omurbek Babanov, coming in with 34 percent. 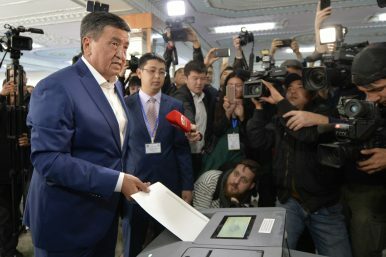 Eleven people in total contested the election, but Jeenbekov and Babanov were long considered the frontrunners. Jeenbekov certainly benefited from his affiliation with current Kyrgyz President Almazbek Atambayev, who made little secret of his preference in the race. But, he went on, “The election has taken place, and the people have made their choice.” A comment certainly aimed at assuaging mounting fears that the heated election would spark unrest. The highest drama in the month-long campaign stemmed from Atambayev’s accusation that Babanov’s September 19 meeting in Almaty with Kazakh President Nursultan Nazarbayev was part of an attempt by Astana to influence the election. It didn’t matter that Jeenbekov met with Nazarbayev on August 14, only a week before resigning from the prime minister post to campaign. With Jeenbekov’s victory, it’s yet to be seen if Atambayev’s smear campaign will serve only to make his successor’s life more difficult. Kazakhstan is the Central Asian region’s largest economy ,and Kyrgyzstan’s access to the rest of the Eurasian Economic Union (EEU) runs primarily through Kazakh territory. Souring the Kazakh-Kyrgyz relationship as an election strategy may have paid off in the short run by turning voters away from Babanov, but could be a liability in the long run. Jeenbekov is to be inaugurated on December 1. Any new Kyrgyz president would face a raft of challenges, most importantly the country’s economy. But Jeenbekov now faces a new challenge that is mostly of Atambayev’s making: rehabilitating the relationship with Kazakhstan. While international observers say in general the election was free and fair, there have been accusations of fraud, misuse of so-called administrative resources, and overstepping of rules that prohibit public figures (like Atambayev) from participating in the campaign. In the end, Kyrgyzstan held a largely peaceful though far from perfect election. The citizens chose a president to take over when Atambayev steps down, as the Kyrgyz constitution mandates. An election is just one facet of a democracy — one we tend to overemphasize. The real test is governing, and Jeenbekov is in for quite the challenge. The October 15 vote raises expectations of policy continuity in a country that has to balance regional, strategic interests.